I’m delighted to welcome Antonia Aquilante back to the blog today, with news of her new book with Dreamspinner, The Artist’s Masquerade, which will be released on December 21st. The carriage door opened when they were nearly to the end of the long dock, and a man climbed down, followed immediately by another man, who turned and reached back into the carriage. When he drew back, it was to help a young woman descend from the carriage to stand next to him. Flavian assumed that one of the men was Velia’s betrothed. He had no idea who the girl was. A sister, perhaps? The first man stepped forward as they approached. He was an older man and regal in his bearing. Flavian studied the man as best he could from his position behind Velia. He was only slightly taller than Velia, and his height made things difficult sometimes. As the man launched into a speech welcoming them, he confirmed Flavian’s suspicions. The man was Umber, duke and father of the man Velia was to marry. Which probably made the other man his son, Cathal, Velia’s betrothed. And so it was. The duke motioned, and the other man stepped up beside him. The duke introduced him, but Flavian hardly heard any of it. He was too busy looking at Cathal. He was tall. Very tall. Without these stupid heeled shoes, Flavian probably would barely be as tall as the man’s shoulder. Shoulders that were deliciously broad. In fact, Cathal’s whole body seemed well muscled, thick but not bulky. Flavian could only imagine the lines of those muscles hiding under the man’s fine clothing. The thought made him yearn for a sketchbook or, better, a canvas and paints. He could see the lines of those muscles taking shape on the page… but he would never paint them. He couldn’t even let himself think of painting them. The rest of Lord Cathal was just as nice. His hair was dark and thick and wavy, well ordered at the moment, but Flavian wondered if that was always true. It had the look of hair with a mind of its own. Cathal’s features were chiseled and quite handsome, but set in serious lines. There was an easily identified resemblance to his father, but despite its seriousness, Cathal’s expression seemed to have less rigidity than his father’s. And his eyes…. Flavian nearly jumped to find himself the focus of Lord Cathal’s unusual gold eyes. Flavian had been so engrossed in studying the man that he must have missed introductions making it around to him. “Lady Flavia.” Cathal’s voice was deep and smooth, and Flavian shivered just hearing it. But the shiver was nothing compared to the heat that flared when Cathal took his hand to bow over it. The heat rushed through his body and left him biting back a gasp. No. Not good. He could not be attracted to him of all men. “My lord,” Flavian replied, trying to keep his voice quiet so his more masculine tone wouldn’t be too noticeable. His voice was the only thing about him that didn’t lend itself to his disguise. Cathal didn’t seem to notice, but he did keep staring at Flavian, gold eyes never wavering. Flavian couldn’t seem to look away either. He wasn’t sure he was breathing, and he wasn’t sure he cared. The soft, yet pointed, clearing of a throat broke the inexplicable tension of the moment. Flavian looked away immediately. What had that been? He could not be attracted to Cathal, his friend’s betrothed. No, he wasn’t. Not at all. 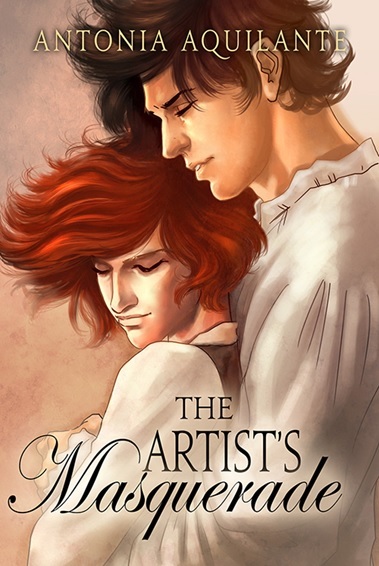 That strange moment was just because the man was so handsome, and Flavian had been thinking about painting him, but he couldn’t paint Cathal, nor anyone else. It had obviously shaken him that he even wanted to. Yes, that was all it was. 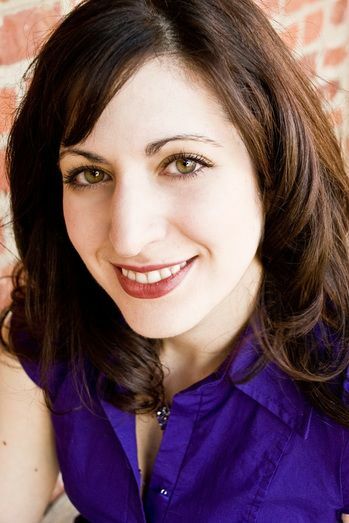 Antonia Aquilante has been making up stories for as long as she can remember, ad at the age of twelve, decided she would be a writer when she grew up. After many years and a few career detours, she has returned to that original plan. Her stories have changed over the years, but one thing has remained consistent – they all end in happily ever after. You’re very welcome, Antonia. All the best with the book! Thanks, Sarah! Hope you enjoy it! Loved the excerpt and the cover is gorgeous! !